While linear regression is about predicting effects given a set of causes, logistic regression predicts the probability of certain effects. This way, its main applications are classification and forecasting. Logistic regression helps find how probabilities are changed by our actions or by various changes in the factors included in the regression. The problem we want to solve is: given a vector of factors X=[X1 ... Xn], find a model that predicts the probability of a binary outcome to occur, P(X, outcome = 1). The input for the model are the previous observations of X and whether the expected outcome was 0 or 1. 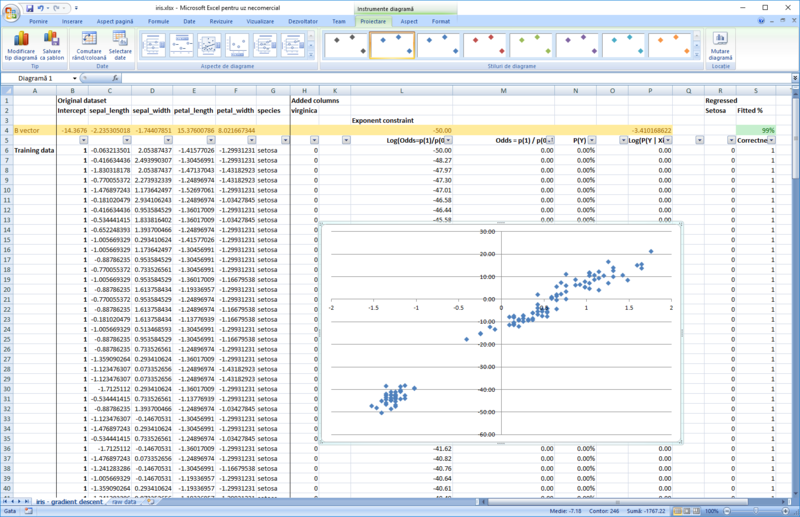 There is not an obvious way to link the results to probability, the regression line goes above 1 and below 0. If in this precise case, one predictor variable, one result, one can simply find a cut-off point, the problem becomes more difficult if we include several predictor variables in the equation. Therefore, we will find a mathematical model that uses the logistic function to map from causes to probabilities. 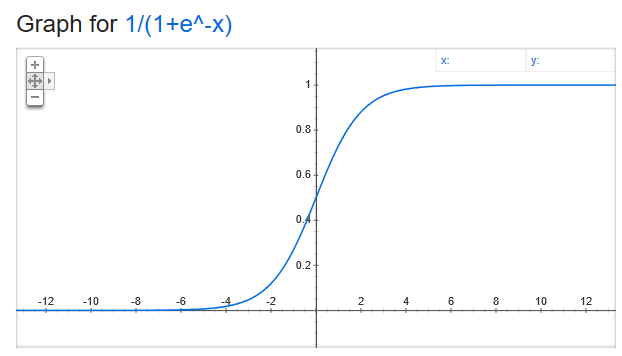 The model aims to find a vector B that, when plugged into the logistic function multiplied by the factors X, the observed results match as closely as possible to the results determined by our model. 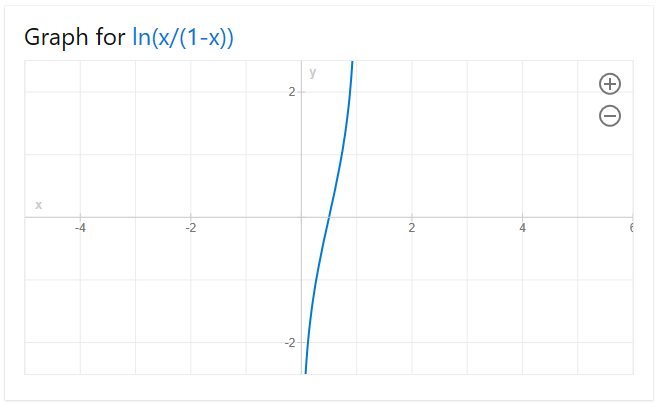 In this case, our logistic function looks like f(X_i) = 1 / (1+e^-(b1 * xi_1 + ... bn * xi_n), where Xi = [xi_1, ... xi_n] are the observed X factors at point i. This is a fancy way of describing a table with n colums defined by X, the regression factors, and 1 column defined by Y, the observed result, with k rows. We conclude that P(yi | X) is another column, that of probabilities, but we cannot fully compute it because we are missing the vector B. PRODUCT(P(yi | Xi), for i = 0..k) = P(y1 | X1) * P(y2 | X2) * ... is maximized, as close as possible to 1.
log(PRODUCT) = SUM(log(P(yi | Xi)) = SUM(yi * log(f(Xi)) + (1-yi) * log(1-f(Xi))) where f(Xi) = 1 / (1+e^-dot(Xi,B)) is maximized as close as possible to 0. Now we can use gradient descent to find the vector B. Unfortunately this method might be slow for large datasets because, for every incremental change in any B, all the exponentials and the logarithms for each line in the dataset need to be recomputed. We download the Iris dataset. We setup 3 variables, one for each type of flower. They are 1 if the flower is of that type and 0 otherwise. We split the data into trainig and test dataset. Add a new column for intercept. Add a new row for the B vector. These are the values we want to find. Add a new column, the log column, log(P(yi | Xi), the column for which the sum we want to optimize as close as possible to 0. The formula for each of the elements in the column is yi * LN(P(setosa) + 0.0001) + (1 - yi) * LN( 1 - P(setosa) + 0.0001). I added a 0.0001 correction factor because, as the maximization algorithm goes on, we might end up with NaN values due to computing P(setosa) = 0 which leads to LN(0) which is -infinity. Add a summary value for the column at 7, as SUM(log(P(yi | Xi))). 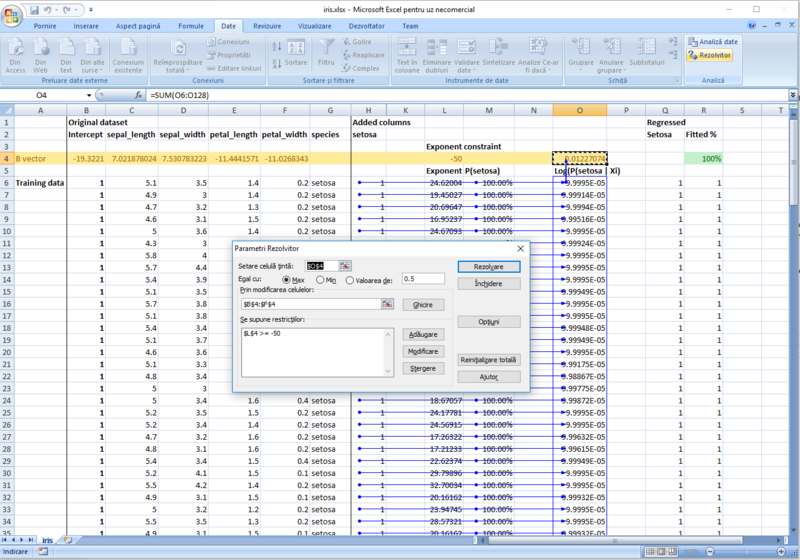 Use Excel Solver plugin to maximize the value of this summary value to as close to 0 as possible. Because the setosa is strictly separated from the other two types, the solver steps continues until the regression becomes very tight and the coefficients very large. In order for the 1/1+EXP(-SUMPRODUCT) not to overflow, I added a constraint for the -SUMPRODUCT() to be less or equal to 50. This does not seem to impact the quality of the regression. Performing the same steps for virginica leads also to very good results, while for versicolor the results are barely above random choice. In the second iteration of the file, I have modified the regression so that it operates on standardized factors. This way, we can interpret the coefficients and see which factor contributes the most for classification. The picture below also contains the log(odds) vs most important factor chart, sorted by odds = P(1) / P(0), the ratio between the probability of 1 and 0. This is also a reminder that data for logistic regression should pe pepared in a similar manner to that for linear regression. The factor we are minimizing, ce = -(y * ln(p) + (1 - y) * ln(1-p)), where y is the observed value (0 or 1) and p is the probability given by our model, is called cross entropy. By the choice for the logistic function, p = 1 / (1+EXP(-SUMPROD(Beta, X))), with Beta the coefficients for each of the factors X included in the regression, including the intercept, Logistic Regression hints stongly towards the linear regression. We introduce the function Odds(p) = p / 1-p with its inverse, p = Odds / (1+Odds). By simple arithmetic, we conclude that Odds(p) = EXP(SUMPRODUCT(Beta, X)) which leads to LN(Odds(p)) = SUMPRODUCT(Beta, X) which is a linear function. Please remember that p is the probability for the event to happen, that is proability for the flower to be setosa, in the example above. This function, ln(Odds(p)) = ln(p/1-p), called the logit function, maps the probability space [0,1] to a linear space [-inf, inf] in which we can do the regression. In order to use linear regression to compute the probabilities and thus build our classifier, we need in our input data probabilities as well. The Iris dataset, as presented above, has only 0 and 1 inputs, so we need to collapse it to intervals on which meaninful probabilities can be computed. Find the real probabilities for a man to be hypertensive given the factors above - please note that we are talking about a small sample of the population, so the real probabilities are not simply the division between men with hypertension and men. Map these probabilities to individual conditions of a patient - he may be fat but not obese or he might just be a casual smoker, metrics which can be represented as fractions of the smoking, obese, snores variables above. If we include an intercept, the intercept will reflect the amount of men included in the test, so, for a single man, the results for the prediction will be completely off. We will see that these results are pretty close to what we will obtain from logistic regression, because the probabilities themselves are in the lower part of the spectrum, where the logistic regression itself is quite linear. However, we expect that, as the risk factors increase significantly, for instance by codifying a “heavy smoker” or a “highly obese”, the results from the linear regression to diverge from the real probabilities. Please see how the variables for smoking, obese and snoring are codified. We want them to affect the slope of the regression, not the intercept. We will do two types of logistic regression - one that does not account for the amount of men included in the sample and one which does. The problem with not ballancing the regression for the amount of men is equivalent to discarding the precision of the initial estimation of probability given by the sample (no of hypertensives / no of men). E.g., the more men we include, the more confident one can be that the expected value of the sample is closer to the actual expected value of the population. First step for both regression is to remove from the regression the line where only 2 men are counted. This line does not contain enough information to be able to codify a probability out of it or, better said, the margin of error is too high. Log(Odds Observed) = LN(P_observed / 1 - (P_observed)) where P_observed = hypertensives / total number of men in that category. Smoking, obesity, snoring, codified as 1 if the person is smoking, obese or snoring. Intercept, all values equal to 1. P Logistic which is the probability as computed from the logistic regression. One under the logistic regression for drawing and validating how probabilities change for various fractions of Snoring, Smoking and Obese predictor variables. """x - column. idx - current index for the row"""
The predictor rows contain the middle of the group range for that particular bin, which does not reflect the actual mean of the data inside the bin. This is highly sensitive to outliers and thus a bad choice. A better way would have been to first split each predictor in equal-sized groups, compute the median for each group, and then use this number as part of the index for each bin. Use the beta distribution and start from an a-priori value of 50%-50% (alpha=1, beta=1), which is equivalent to saying just before we started to count we have observed an opposite value and adjust the probability based on this formula - this gives us an upper (or lower) bound for the probability of 1 in that particular bin. Assume that the string of 0s or 1s was a random extraction from the all possible extractiobs but that it had a rather high probability to occur (of 50% in this case, a value which seemed right to me :) ). Thus consider p^bin_size = 0.5 and compute p=EXP(LN(0.5) / bin_size). We used logistic regression to build a clasifier on the Iris dataset and to predict the probability of a person having hypertension given a set of predictors. We used two ways to compute the regression coefficients: one by maximizing directly a probability function using the gradient descent, the other by applying linear regression to the log-odds function and then computing the probabilities from it. The third example was to process the Iris dataset used in the first regression and to compute the coefficients in a similar manner to that used for determining hypertensives. If we set the classification decision to 1 when p(1) > 0.5, given the equation of the logistic function, it is equivalent to saying y = b0 + ... bn*xn > 0. This is the equation of a line which divides the factor space in two sections. If we want to divide the space into an enclosed area, with outside and inside spaces, we can set, for instance, the regression to include squares of its factors, like y = b0 + b1*x1 + b2*x2 + b3*x1^2 + b4 *x2^1. In this example, for instance, if we set b0 = -1, b1 = 0, b2 = 0, b3 = 1, b4 = 1, at the boundary condition we arrive precisely at the equation for a cirle, 1 = x1^2 + x2^2.